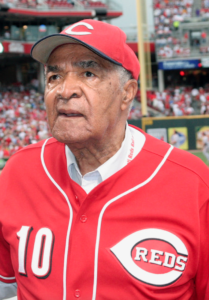 Charles Byron Harmon, who integrated The Cincinnati Reds in 1954, died March 19, 2019, at the age of 94. Harmon played for the Cincinnati Redlegs (1954–1956), St. Louis Cardinals (1956–1957) and Philadelphia Phillies (1957). “The entire Reds family is saddened to lose one of its great ambassadors. The first African American to play for the Reds, Chuck Harmon was much more than a ballplayer. He represents a pivot point in Reds history,” Reds Chief Executive Officer Bob Castellini said of Harmon’s death. Segregation was ingrained in America when Harmon played in the majors. He had to stay in a separate hotel or private home while on the road with the team. 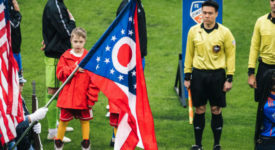 Also, some Cincinnati fans were not accepting of Black players. The tenth of twelve children, Chuck Harmon was schooled as an athlete at Dunbar Elementary by legendary Franklin Wonder Five basketball player Burl Friddle, Harmon played for the Washington, Indiana, High School Hatchets, who won two consecutive Indiana state basketball championships in 1941 and 1942. His brother Bill also played for the 1941 team. Harmon served in the navy during World War II spending all three years stateside. Harmon and longtime teammate and friend Art Grove reunited with Friddle to play for the University of Toledo, where they helped an all-freshman squad advance to the championship game of the National Invitation Tournament, losing to St. John’s. Grove and Minor went on to play professional basketball. After a three-year stint in the U.S. Navy, Harmon returned to the University of Toledo, where he served as the Rockets’ co-captain in both the 1947–48 and 1948-49 seasons. Harmon was also a baseball star for the Rockets. For its 1950–51 season, the National Basketball Association was integrated. Harmon tried out for the Boston Celtics but was cut. 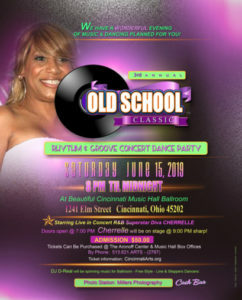 He finished that season as player-coach of Utica in the American Basketball League, becoming one of, if not the first, African Americans to coach an integrated professional basketball team. On April 17, 1954, he became the first African American to play for the Cincinnati Reds. Pinch-hitting for pitcher Corky Valentine against Lew Burdette, Harmon flied out in the seventh inning of a 5-1 loss to the Milwaukee Braves in Milwaukee. In that game, he came to bat after another rookie, Nino Escalera, an Afro-Latin American from Puerto Rico who pinch hit immediately before Harmon to become the first Black player to appear for the Cincinnati franchise. Harmon got his first hit on April 25, 1954. Starting and leading off for the Reds at home in Crosley Field in a 3-2 win over the Chicago Cubs, Harmon doubled and scored on an error, and drew one walk. His final game was the site of his first, Milwaukee‘s County Stadium on September 15, 1957, where, appearing as a pinch runner for the Philadelphia Phillies, he scored his final run on a double play. Harmon hit over .300 during five consecutive minor league seasons, but never approached such numbers in the majors. In between, Harmon played winter ball in Puerto Rico with the Leones de Ponce and Criollos de Caguas clubs in the 1953-54 and 1955-56 seasons, respectively, while appearing with the Puerto Rican champion Caguas in the 1956 Caribbean Series. In a four-season major league career, Harmon was a .238 hitter with seven home runs and 59 RBI in 289 games played. After his Major League career ended, he played four seasons in the minors, from 1958 to 1961 in AAA leagues for five teams. 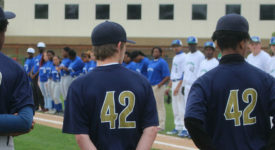 Following his playing career, Harmon worked as a scout with the Cleveland Indians and Atlanta Braves in baseball, and the Indiana Pacers in basketball. 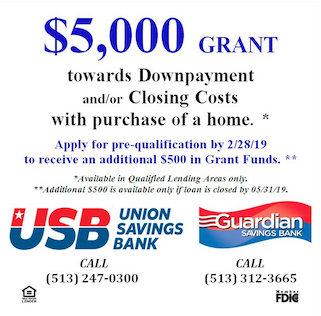 Later he worked as an administrative assistant for the Hamilton County Court System in Cincinnati. He remained active in SWAP (Seniors With A Purpose) and other youth-related services. In 1977, Harmon was inducted as part of the inaugural class of the University of Toledo Athletic Hall of Fame. He was inducted into the Indiana Baseball Hall of Fame in 1995. 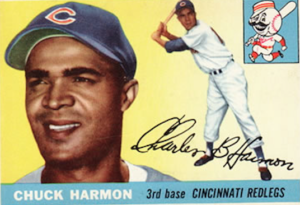 In 1997 in the Cincinnati suburb of Golf Manor, the community renamed one of its streets “Chuck Harmon Way” after its longtime resident. In addition, in cooperation with the Cincinnati Reds, a renovated ball field was named in his honor in the multi-use municipal Volunteer Park. 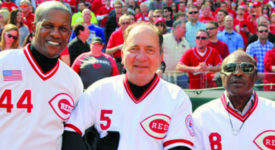 On April 20, 2004 (the 50th anniversary of Harmon’s debut as the Cincinnati Reds’ first African American player), the Reds honored him during Chuck Harmon Recognition Night at Great American Ball Park. The pregame ceremonies included the unveiling of a special historic plaque, which now hangs near the entrance of the ballpark. Harmon was married for 62 years to his wife, Daurel “Pearl” Harmon, who died in November 2009. They had three children.